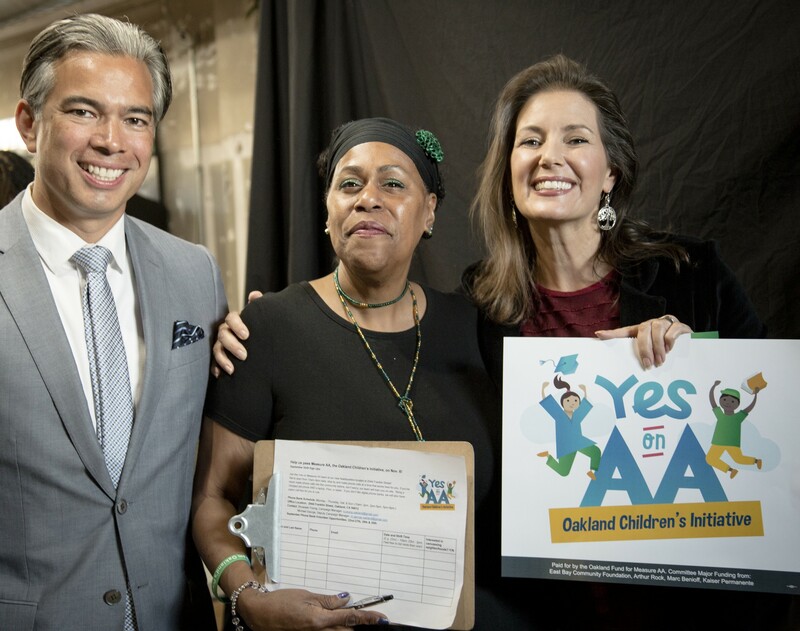 The well-funded Oakland Children's Initiative — Measure AA — is providing the mayor with the equivalent of hundreds of thousands in campaign ads while she runs for reelection. Schaaf has been featured in Measure AA ads. Last month, in a Telegraph Avenue loft at the kickoff event for Measure AA, also known as the Oakland Children's Initiative, about 100 people crowded around Mayor Libby Schaaf as she extolled the ballot measure's potential — $30 million raised annually through a $198 parcel tax, all of it paying for early childhood education and college readiness programs. "Who could be against kids?" Schaaf asked her supporters. "Who is not for this? This has to win." With that, she advised everyone to "wear out their shoes" campaigning for Measure AA. But by campaigning for Measure AA, supporters are also indirectly campaigning for Schaaf, who is currently running for reelection. Campaign materials for the Children's Initiative prominently feature Schaaf, giving her an advantage over her opponents in the mayor's race by spreading her image and words throughout the city, all framed in the unassailable context of advocating for low-income children. And because ballot measure campaigns aren't subject to the same kinds of financial restrictions and contribution limits as candidate committees, the Measure AA campaign can accept much more funding from sources that might otherwise be restricted from giving directly to Schaaf's mayoral reelection effort. So far, the main committee supporting Measure AA, "The Oakland Fund for Measure AA," has raised more than $1.6 million in 2018. It's a prodigious amount of money in the context of a mayor's race in which Schaaf already has a large financial advantage. As of Oct. 20, Schaaf's mayoral campaign committee reported raising $228,324 this year for her reelection effort — after starting off the year with $226,070 in the bank. By contrast, her two main opponents, according to a recent Oakland Chamber of Commerce poll, have raised less. Cat Brooks reported a year-to-date total of $154,106 last week, while Pamela Price reported only $75,801. The Measure AA campaign has paid for hundreds of thousands of dollars in TV, radio, and web ads, as well as mailers that include photos and quotes by Schaaf. While she isn't the sole author or spokesperson for Measure AA, she is the person most commonly featured in ads and on mailers. Measure AA is also closely linked to Schaaf's signature education initiative that she launched in 2016 as mayor, the Oakland Promise — a college readiness program that has mostly been funded by private philanthropic sources. If approved by voters, Measure AA would allocate tax revenue collected into a "Oakland Promise Fund" that will be managed by a nonprofit organization, thereby institutionalizing Schaaf's Oakland Promise as a program with robust, long-term government funding. There are other links between the Measure AA campaign and Schaaf. SCN Strategies, the political consulting firm running Schaaf's 2018 reelection bid, is simultaneously working as the adviser to the Measure AA campaign. And Sadler Strategies Media, a political marketing firm, is running media operations for both Schaaf's mayoral campaign and Measure AA. Under Oakland's Campaign Reform Act, a candidate for mayor, or any other office, "may not directly or indirectly use or influence the use of ballot measure committee funds to support the candidate's or elected City Official's election." Although there is significant overlap between the Measure AA campaign's contributors, volunteers, and paid consultants, the Measure AA campaign committee does not appear to be controlled directly by Schaaf, although it's treasurer, Eugene Zahas, is a longtime Schaaf supporter. The Schaaf mayoral campaign, however, said it doesn't think her advocacy for Measure AA has helped her. "Being for a tax increase in a reelection campaign does a candidate more harm than good," said Zoe Kleinfeld, a Schaaf campaign spokesperson. Much of the money paying for Children's Initiative ads featuring Schaaf has been contributed by a handful of wealthy individuals and corporations, several of whom are currently negotiating with the city over real estate deals or lobbying for business and land-use permits. Under the city's elections law, some of these contributors could be prohibited from directly contributing to Schaaf's mayoral campaign committee. The city's Campaign Reform Act bars contractors from making campaign contributions to candidates or officeholders while they are in negotiations with the city, and for up to 180 days after a contract has been voted on by the city council. But according to campaign finance records, Julian R. Orton has contributed $75,000 since August to the Measure AA campaign. Two of Orton's employees contributed another $2,000. According to public records, Orton Development has been communicating with Oakland officials since 2013 for a long-term ground lease and the rights to redevelop the city-owned Henry J. Kaiser Auditorium into a private office center. In July 2015, the Oakland City Council selected Orton Development as the sole developer for the Henry J. Kaiser Auditorium and approved a one-year period of exclusive negotiations between the city and company. In July 2016, Oakland City Administrator Sabrina Landreth approved a six-month extension to the ENA, but the authorization for exclusive talks expired in January of this year. Nevertheless, city staff continue to hold exclusive and private talks with Orton Development regarding the Kaiser Auditorium property. The closed session city council meeting this week included a scheduled discussion of the city's ongoing negotiations with Orton Development over the proposed Kaiser deal. Other developers and contractors doing business with the city have contributed money to the Measure AA campaign. For example, a pair of companies called W/L Telegraph Owner JV, LLC and Riverock Real Estate Group gave $1,500 to the Measure AA campaign in July. According to business registration records, W/L Telegraph Owner JV is a joint venture between a Chicago-based investment company called Walton Street Capital and the Menlo Park-based real estate company Lane Partners. Lane Partners is in negotiations with the city to take over several city-owned parcels at the corner of Telegraph Avenue and Thomas L. Berkeley Way. Telecom giant AT&T contributed $12,000 to Measure AA in August. The company disclosed on lobbyist registration filings this year that it lobbied Schaaf and other city officials regarding permits to build cellphone towers in Oakland. Planning Commission records show that AT&T sought major conditional use permits for small cellular antennas on city-owned street lights and poles earlier this year. Schaaf nominates members of the planning commission and her mayoral campaign committee treasurer is Amanda Monchamp, the planning commission's vice chair. As of last week, the Measure AA campaign had spent $1.3 million, including approximately $360,000 on advertising — much of it featuring Schaaf, according to campaign statements filed with the Oakland Public Ethics Commission.